Some of the artists represented in these recordings have shaped our music industry and left their mark, such as the likes of John Farnham, Olivia Newton John and Tina Arena. Other Australian influences on the album include director Baz Luhrmann with his dazzling screen masterpiece 'Moulin Rouge' and the late legendary performer Peter Allen with his musical 'The Boy From Oz', which launched Australia onto the world stage. The tracks are a compilation of covers from popular “Classical Crossover,” 'Pop Opera' style music. Many of these songs have been made famous by world renown singers like Andrea Bocelli and Sarah Brightman to mention a few. The album duets were recorded with Grace Bawden from Australia and international multi platinum selling artist Petra Berger from the Netherlands. 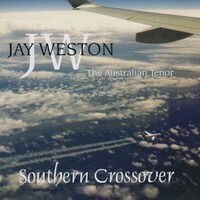 The original songs were written by Australian tenor Jay Weston. Together these combine to create a distinctively international yet uniquely Australian concept album, Southern Crossover. No mater what your taste or preference in music, this album hopes to bring you many hours of listening pleasure and inspire your passion for Australian and International Music. Be the first to review “Southern Crossover - Download” Click here to cancel reply.